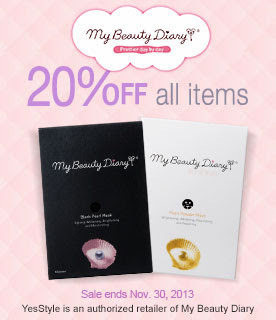 I was on the YesStyle site to check something and noticed they are having 20% off all My Beauty Diary items!! OMG I got excited and almost got tempted to buy more masks but I already have 4 boxes at home that I'm still trying to finish. I'm also currently on an online shopping ban because I still haven't found permanent full-time employment yet and I only get benefits from EI for not long. So I'm trying to save money and only buy things that I really need. But for anyone else who is interested, go shop away at yesstyle.ca and yesstyle.com. If you're unfamiliar with the brand My Beauty Diary then you can read about my review on their masks.